obtain categorical exclusion determination in connection with all airspace agreements, lease agreements, disposals, hardship/protective acquisitions, and relinquishments for compliance with 23 CFR 771.117 (d). District right of way will complete Section A Categorical Exclusion Review (Form 236.3.1.2). Submit with attachments to the Design Division, Environmental Section for their determination that this action meets the criteria for a CE. The Design Division, Environmental Section will complete Section B of the form to arrive at CE determination and return to District right of way. On Interstate and Major Bridge projects district right of way will send the CE Request to the Right of Way Section who will submit the completed Form 236.3.1.2 to the Federal Highway Administration for their review and approval. District right of way will submit the completed form with all other necessary documents to Right of Way Section for review and approval of airspace agreements, lease agreements, disposals, and hardship/protective acquisitions. In addition to coordinating with the various districts on the above, it is Right of Way Section’s responsibility to develop the administration policies and procedures necessary for compliance with MoDOT needs and Federal Highway Administration requirements. The following sections of this article describe the policy and procedure requirements for the administration responsibilities as listed above. MoDOT’s program for right of way acquisition is included in the Statewide Transportation Improvement Program (STIP) as prepared and assembled by the Transportation Planning Division and annually approved by the Missouri Highways and Transportation Commission. The districts are responsible for identifying those projects that will be included in the STIP and completing the SIMS Forms with the appropriate project information. The program is MoDOT’s right of way and construction plan and is based on available funds from all sources of income, improvement and rebuilding needs throughout the state, and priorities and capabilities of the various districts and divisions of the department. The program is a carefully prepared and comprehensive schedule for a coordinated plan of right of way acquisition and construction for the various systems within the department's network of highways. It is the responsibility of district right of way to furnish accurate estimates of the funds needed for the proposed right of way acquisition. The final program is presented annually to the Missouri Highways and Transportation Commission for review and approval. The Statewide Transportation Improvement Program is the definite control over right of way acquisition insofar as scheduling and funding is involved. Extreme care must be taken to ensure that each job reflected in the program contains the latest available estimate of cost (Note: the programmed amount cannot be changed if the project is in the current fiscal year) and that the capabilities of the district staff are such that acquisition reflected in the program can be accomplished as planned. Each year the districts identify those projects that will be included in the STIP. Each job estimate should be carefully reviewed at this time and revised estimates should be furnished to the project manager. Careful planning prior to this review should eliminate the necessity of numerous revisions to the program subsequent to Commission approval of a project for the active fiscal year. The programmed amounts shown in the STIP for the current fiscal year cannot be changed. It is important to make sure that at some point during the fiscal year an "A-Date" is issued or the programmed funds will not rollover to the next fiscal year. See EPG 236.3.4 for the requirements necessary for issuing an A-Date. The programmed right of way dollars do not have to be spent during the fiscal year in which they are programmed. Once an A-Date is issued, the funds will be rolled over to subsequent years until the project is cleared. The Right of Way Section is authorized to acquire right of way for the amounts on the Commission-approved program, as long as the total acquisition expenditures do not exceed the total approved programmed amount. When the total expenditures will exceed the total Commission-approved amount, a revision to the program is to be considered. It is up to the project manager and district right of way to identify any needed revisions to the right of way programmed amount contained within the STIP. If there is a significant change in the right of way cost estimate for a project, district right of way should advise the project manager. The project manager advises the planning coordinator who balances the district STIP budget. If additional funds are needed for a project, the planning coordinator coordinates any funding shifts within the district STIP budget. For projects that come out of the district STIP budget, the project manager or planning coordinator completes a SIMS form, which is forwarded to the district engineer for approval. Changes that only affect the districts STIP budget require approval by the district engineer. Major projects are funded at least partially from statewide funds and are fixed by project. Changes to these projects require approval from both the district engineer and the Transportation Planning Director. Plans for right of way acquisition are prepared by district design and approved by the district engineer in the respective districts. District right of way shall review plans and coordinate any requirements or recommendations with district design. When the plans are finalized and accepted for right of way use, an A-Date is requested by submittal to the Right of Way Section by the district. District design will furnish copies of any subsequent revisions to the plans to district right of way with a transmittal letter that individually identifies the revisions being submitted. Right of way plans as acquired will be furnished to the Right of Way Section with the submittal of the Right of Way Clearance Certification. It is essential that cooperation, communication and coordination between district design, including the transportation project manager and core team members, and district right of way be maintained in the development of plans and the estimate of costs for right of way acquisition. For more information on right of way plan development see EPG 236.13.7 Plan Development. All right of way cost estimates shall be prepared by district right of way upon request from district design and/or the transportation project manager. (Refer to EPG 124.1.1 Quality Control.) Requests may take on a format agreeable to the parties involved, and may be for individual jobs or lists of unchanged projects that require update. If right of way were to initiate a cost estimate activity prior to a request from district design or the transportation project manager, project status may be documented on Right of Way Cost Estimate (Form 3.3.3B), to satisfy the request requirement. All right of way cost estimates shall be prepared by district right of way in coordination with district design and the transportation project manager. If plans are not available, district design shall furnish the most complete project information available including, but not limited to, the project development stage, type of improvement being considered, the length of the project, the widths of the proposed new right of way, the type and location of anticipated interchanges, the type and extent of access controls and a recent aerial photograph or map of the area with the proposed line or corridor of improvement drafted in as much detail as possible. If the plans have changed since the last estimate, or estimates of multiple scenarios of a project are sought, district design should identify changes and assign scenario titles, so that the project history and growth of each scenario can be tracked. Estimates at the Project Initialization stage should be prepared in as much detail as possible from the limited scope that is available at the time, with the understanding that the programmed amount may not require updating until the project is placed on the approved Statewide Transportation Improvement Program (currently the 5 year program) several years later. Updating of projects beyond the approved program ("future projects" outside 5 years) may require individual attention by district right of way, or may be updated by factors. A determination of what detail of update is necessary for the future projects will be made on a statewide basis, prior to each programming cycle. Projects within the approved program (currently the five year program) should be prepared in as much detail as possible from the design information that is available at the time. This may include projects in the Project Initialization stage. Estimates for projects within the approved program must be updated at least annually and at milestones of plan development. Right of way cost estimates are prepared and updated annually, to correspond with programming requirements for the fiscal year ending June 30. Estimates may be prepared or updated after September first of each year for the upcoming estimate cycle. All right of way cost estimates will use the Right of Way Cost Estimate Worksheet (Form 3.3.3A) to update information pertaining to cost estimates. Estimates based on comparative unit cost methods (cost per mile, etc.) may be prepared on a letter or memo format identified as a replacement for the Worksheet (Form 3.3.3A) in the Project Initialization and Conceptual Plan/Location Study Completion stages. The estimate conclusions for right of way and incidentals will be transmitted to district design using the Right of Way Cost Estimate Transmittal (Form 3.3.3B). The following instructions assure procedural uniformity by the districts in the development and submission of right of way cost estimates. The Right of Way Cost Estimate Transmittal (Form 3.3.3B) will be sent to the district design engineer and the transportation project manager. The Right of Way Section will receive copies at the Right of Way Plan Completion. This estimate is made when a project is first placed on the Statewide Transportation Improvement Program and may stay in this plan development stage through subsequent programming cycles. Information for making a right of way estimate at this stage is normally tentative since the exact location, scope, design, extent of right of way required, damages, and relocation have not been determined. Utilizing information provided by district design, prepare a Right of Way Cost Estimate Worksheet (Form 3.3.3A) and Right of Way Cost Estimate (Form 3.3.3B). In the transmittal form, provide explanation for any change in the cost estimate conclusion from the previous estimate if any. Overall comparative unit costs (cost per mile, for example) may be used, without use of a worksheet, if a highly similar completed project is available for comparison. If a unit cost comparison is used the estimate shall reflect costs for right of way and incidentals separately and shall include data on the comparable project and calculations leading to a cost conclusion. This estimate is prepared by district right of way for the various alignments and scopes of work being considered by district design. Utilizing information provided by district design, prepare a Right of Way Cost Estimate Worksheet (Form 3.3.3A) and Right of Way Cost Estimate Transmittal (Form 3.3.3B). The cost estimate for each alternative alignment shall have a separate worksheet and transmittal. In the transmittal, provide explanation for any change in the cost estimate conclusion from the previous estimate. This estimate is prepared after final determination of location has been made and a preliminary plan is furnished to district right of way by district design. The preliminary plan may indicate areas of taking and parcels to be affected. Utilizing preliminary plans provided by district design, prepare a Right of Way Cost Estimate Worksheet (Form 3.3.3A) and Right of Way Cost Estimate Transmittal (Form 3.3.3B). In the transmittal, provide explanation for any change in the cost estimate conclusion from the previous estimate. An updated estimate is not necessary at this milestone. Each right of way cost estimate shall be developed by use of the Right of Way Cost Estimate Worksheet (Form 3.3.3A) or an appropriately supported estimate memo if an overall comparative unit cost method is used, in accordance with the following instructions. Each district shall maintain records sufficient to document all estimated costs. 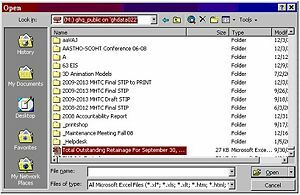 A list of improvements anticipated to be affected is to be retained in each file. Other required documentation will include rates or indicators resulting from an analysis of previous projects, market information, assessor's records, statistical reports, and cost manual information along with reasons for selection of specific data and calculations used to reach conclusions. Abstracted costs may be adjusted to fit circumstances, with the requirement that all such adjustments be explained. Land use may be as general as agricultural, residential, commercial, industrial or as specific as available project scope information allows. Right of way areas to be acquired shall be provided by district design. Estimated unit values must be supported by reference to market information such as confirmed sales, listings or documented discussions with realtors, lenders or other real estate professionals, or by historic acquisition data. This cost may be estimated by itemizing improvements that are expected to be acquired and estimating the value of each. Alternately, the total number of improvements at an average unit value may be used. A list of affected improvements shall be attached to the worksheet. If individual improvement values are estimated they shall appear on the improvement list. Estimated values shall be supported by reference to sales, listings, or documented discussions with realtors, lenders or other real estate professionals. Other acceptable sources of support include cost manuals with citation of section, page number and revision date, reference to assessors' records and historic acquisition data. To arrive at improvement value, supported land value must be deducted from the dollar value of improved sales, listings or acquired properties. Fence to be acquired may be estimated as a lump sum for the project, or on a parcel basis. Acceptable support for fence cost includes reference to a fence cost schedule, bid or contract, or to a cost manual citing section, page number, revision date or other identifying information. Total the amounts in the Total Land and Major Improvements field of all Form 6.4.3s or the Land and Improvement Amount of the Right of Way Parcel Acquisition Parcel forms for all parcels of a given project. Total the amounts in the Damages to Remainder field of all Form 6.4.3s or Right of Way Parcel Acquisition Parcel forms. Divide total damages to remainder by total land and improvement amount. After right of way plans are available, effects to individual parcels may be considered and supported by reference to costs of specific acquired parcels. The district experience in administrative settlements is the total of settlement amounts above approved offers, including administrative settlements for heritage and homestead payments for a given year divided by the total of approved offers for the same period, expressed as a percentage. This percentage may then be applied to the sum of paragraphs (a), (b) and (c) above to arrive at the total administrative settlement amount for the project being estimated. Alternately, the percentage of administrative settlement dollars above the total approved amounts for a given comparable project may be applied to the sum of paragraphs (a), (b) and (c) above. Data sources must be cited and calculations shown. This is the amount by which project costs may be expected to increase as a result of condemnation. Condemnation history must be analyzed on a per-project basis. Divide the amount by which commissioners' awards and legal settlements exceed approved offers for condemned parcels by the total of approved offers for a cleared project to produce the percentage by which condemnation may be expected to increase acquisition cost. This percentage must be applied to the sum of paragraphs (a), (b) and (c) above. Projects selected for comparison to the project being estimated should be the most similar available, preferably in the same court jurisdiction. This is the estimated cost of all anticipated relocation assistance payments. Relocation costs may be estimated by comparison of the subject project to a previous project which had similar relocation elements, with the average payment per relocation parcel for the completed project multiplied by the anticipated number of relocation parcels on the project being estimated. Care should be used in selecting the project for comparison. In later project stages relocation cost may be estimated on a per parcel basis with support. Alternately, a typical or average relocation cost for elements like residential, business, etc. may be developed and applied. Additional support data is available in the Annual Relocation Statistical Report (Uniform Act Report) described in EPG 236.8.6.6. Incidental costs may be estimated by multiplying the subtotal of the costs estimated in Paragraphs (1) through (5) above by the annual percentage for the district as shown on the Summary, Percent of Incidental Expenditures to Total Dollars Expended in the Right of Way Section Annual Statistical Report. Incidental cost may also be expressed as a cost per parcel, derived from completed projects exhibiting similar characteristics in terms of location, number of parcels and complexity. The comparable project must be cited along with calculations of the historic incidental cost per parcel. Submit the Right of Way Cost Estimate Transmittal (Form 3.3.3B) to the district design engineer and the transportation project manager. Current and historic right of way worksheets and supporting documentation may be maintained with a central project file within district design or in a separate right of way project file. A matching Form 3.3.3B should be maintained in the central project file and the right of way project file, regardless if the files are physically combined or separate. The following procedures for requesting authority for right of way acquisition activities and funding shall be used for state and federally funded right of way projects. Prior to submitting a request for acquisition authority, the transportation project manager (TPM) must verify funds are available in the current fiscal year. The district right of way manager or designee in cooperation with the TPM should determine whether state funds only or federal participation will be requested in the right of way phase of the project. The district right of way manager must ensure proper documentation is received before an acquisition date (“A” date) is requested. Of particular importance are the easement needs of utilities located on the proposed improvement (see EPG 643.2.1.5 Right of Way). The transportation project manager must verify all environmental classifications and cultural resource (EPG 127.2 Historic Preservation and Cultural Resources) approvals are complete. The transportation project manager (TPM) must verify that the right of way plans have been approved, funding is available in the current fiscal year, environmental classifications and historic preservation approvals have all been secured prior to submitting an Acquisition Authority Date, A-Date (Form 3.4.2). Limited acquisition authority may be requested when it is necessary to begin making charges to the right of way phase of the project. Limited acquisition authority provides for all right of way activities up to and including appraisals. Also, acquisition and relocation activities may proceed on parcels identified as total acquisitions. This authority shall be provided prior to incurring right of way charges to the project. Preliminary acquisition activities, including a title search, appraisal, appraisal review and waiver valuation preparation, preliminary property map preparation and preliminary relocation planning activities, limited to searching for comparable properties, identifying replacement neighborhoods and identifying available public services, can be charged to the preliminary engineering phase of the project. For this reason, limited acquisition authority is not required for all projects. A. The following procedure is to be used only when requesting federal participation in right of way acquisition and limited acquisition authority is being issued. The transportation project manager will submit an Acquisition Authority Date (Form 3.4.2) to Right of Way Section. All information on the form must be complete. Right of way activity involving contact with affected property owners for purposes of negotiation and relocation assistance are to be deferred until after NEPA approval and until the transportation project manager receives a copy of FHWA's approval from Financial Services/Right of Way Section. The Right of Way Section will review the Limited Acquisition Authority request and once approved will coordinate with Financial Services to set up the project and FMS project number. Limited acquisition authority may be issued more than one time on a job. In this event, fill in funds authorized for total acquisitions this request and total funds authorized to date, which is an accumulation of funds authorized. Incidental costs should not be included. A-Dates are to be parcel specific, therefore each request should list the parcels individually. Complete the appropriate box at the bottom of the form for Financial Services information. B. The following procedure is to be used only when right of way is to be acquired with state funds and limited acquisition authority is being issued. The transportation project manager shall provide Form 236.3.4.2 to district right of way with a copy to the Right of Way Section. The preferred method for transmittal to the Right of Way Section is via email to the Asst. to the State Design Engineer - Right of Way with all required information attached. The Right of Way Section will review the Limited Acquisition Authority request and once approved will coordinate with Financial Services to set up the project and FMS project number. Limited acquisition authority may be issued more than one time on a job. In this event, fill in funds authorized for total acquisitions this request and total funds authorized to date, which is an accumulation of funds authorized. Incidental Costs should not be included. A-Dates are to be parcel specific, therefore each request should list the parcels individually. Complete the appropriate box at the bottom of the form for Financial Service’s information. The transportation project manager (TPM) must verify that right of way plans have been approved, funding is available in the current fiscal year, environmental classifications and historic preservation approvals have all been secured prior to submitting an Acquisition Authority Date (A-Date). Acquisition authority on a project may be authorized when the total project or a portion of a project is being funded. Acquisition authority includes all phases of right of way activity. A request for acquisition authority and project funding shall be submitted on Form 236.3.4.2 (Acquisition Authority Date) by the transportation project manager to Right of Way Section, for coordination of federal funds. All information on the form must be completed. Right of way activity involving contact with affected property owners for purposes of negotiation and relocation assistance are to be deferred until after NEPA approval may not commence until the transportation project manager receives a copy of FHWA's approval from the Right of Way Section. The Right of Way Section will review the Acquisition Authority (A-Date) request and once approved will coordinate with Financial Services to set up the project and FMS project number. Acquisition authority may be issued more than one time on a job. In this event, fill in funds authorized this request and total funds authorized to date, which is an accumulation of funds authorized including funds authorized for Limited Acquisition Authority. Incidental costs should not be included. A-Dates are to be parcel specific, therefore each request should list the parcels individually. Complete the appropriate box at the bottom of the form for Financial Services’ information. The funds authorized cannot exceed the amount programmed for right of way acquisition on the project in the current fiscal year. The transportation project manager shall provide Form 236.3.4.2 to district right of way with a copy to Right of Way Section. The preferred method for transmittal to the Right of Way Section is via email to the RWPayments e-mail group with all required information attached. The Right of Way Section will review the Acquisition Authority (A-Date) request and once approved will submit the request to Financial Services to set up the project and FMS project number. Acquisition authority may be issued more than one time on a job. In this event, fill in funds authorized this request and total funds authorized to date, which is an accumulation of funds authorized including funds authorized for Limited Acquisition Authority. Incidental costs should not be included. A-Dates are to be parcel specific, therefore each request should list the parcels individually. Complete the appropriate box at the bottom of the form for Financial Services’ information. The funds authorized cannot exceed the amount programmed for right of way acquisition on the project for the current fiscal year. Prior to the acquisition authority for design-build projects the project funding must be approved and available in the appropriate fiscal years. The acquisition authority (A-Date) date will be requested at the same time construction obligation is requested, which occurs just before the request for proposals. The Right of Way Section will advise the district when the construction obligation request has been submitted, and then the district will submit the A-Date request as usual. A district may submit the A-Date request if the project has NEPA and Section 106 environmental clearances, funding approved and available in the current fiscal year and approved right of way plans. For more process details regarding Design-Build projects, please refer to EPG 139 Design - Build. a public hearing has been held or an opportunity for such hearing has been afforded. The transportation project manager will issue acquisition authority only after the Right of Way Section has approved the hardship or protective purchase status of a parcel. Requests for hardship or protective buying on federally funded projects will not be considered on parcels located within 4(f) land or historical properties until the required Section 4(f) determination and the procedures of the Advisory Council on Historical Preservation are completed. Acquisition of hardship or protective buying parcels shall not influence the environmental assessment of a project including the decision relative to the need to construct the project or the selection of a specific location. Ultimate federal participation in the cost of hardship or protective buying parcels is dependent upon the incorporation of such property in the final highway right of way. When a parcel is partially incorporated in the right of way, federal funds will not participate in the remainder whether acquired as an uneconomic remnant or excess property. Should a decision be made to acquire hardship or protective-buying parcels with state funds prior to Federal Highway Administration program approval on federally funded projects, such acquisition will not jeopardize federal participation in subsequent project costs. However, said acquisition must be in compliance with the provisions of Title VI of the Civil Rights Act of 1964 and the Uniform Relocation Assistance and Real Property Acquisition Policies Act of 1970 as amended. Follow the limited acquisition authority process previously outlined. Traditional early acquisitions are acquired upfront using state funds only, with the option to request federal participation when the parcel acquired early is incorporated into the final project limits. Federally funded early acquisitions are used when federal funds are being sought at the time the acquisitions authority (A-Date) is being requested. Federally funded early acquisitions can only be used for the purchase of real property interests being acquired without the threat of condemnation. Demolition and other construction activities cannot take place on a federally funded early acquisition parcel until such time as the overall project construction activities take place. 2. NEPA Classification and date and Section 106 approval date. 3. The State Fiscal Year the project has been programmed in the STIP/TIP for acquisition. h.	will not result in a reduction or elimination of benefits or assistance to a displaced person required by the Uniform Relocation Assistance and Real Property Acquisition Policies Act of 1970 (as amended) and Title VI of the Civil Rights Act of 1964. 5. The reason for acquiring the parcel early. Upon receipt of the A-Date, conceptual plan and certification, the Right of Way Section will submit the documentation to FHWA for approval, and then advise the district when the acquisition process may begin. If the parcel cannot be acquired through negotiations, the district shall rescind the offer in writing to the property owner, and advise the Right of Way Section of such action, so the previously requested funding can be de-obligated. Traditional early acquisitions are acquired upfront using state funds only, with the option to request federal participation when the parcel acquired early is incorporated into the final project limits. Property subject to condemnation is allowed. FHWA concurs with Central Office Right of Way that the early did not influence NEPA for the proposed project including: the need to construct, consideration of alternatives and selection of design or location. Federal Reimbursement maybe requested after NEPA, section 4(f), and all other environmental review/approval requirements are complete. Reimbursement of acquisition costs is based on the usual cost to acquire. 2. The State Fiscal Year the project has been programmed in the STIP/TIP for acquisition. g. will not result in a reduction or elimination of benefits or assistance to a displaced person required by the Uniform Relocation Assistance and Real Property Acquisition Policies Act of 1970 (as amended) and Title VI of the Civil Rights Act of 1964. 4. The reason for acquiring the parcel early. Upon receipt of the A-Date, conceptual plan and certification, Central Office Right of Way will review and then advise the district when the acquisition process may begin. economic problems - wide range of financial disadvantages or maladjustments, personal financial losses that are beyond the relocatee's capability to resolve. The district right of way manager shall investigate each application for hardship acquisition and request concurrence in the hardship from the Right of Way Section for those requests that they determine have sufficient documentation to qualify as a hardship. The written request to the Right of Way Section shall contain a statement pertaining to the current status of the project involved and the district right of way manager's recommendation for early acquisition and why it would be in the public’s best interest. a certification from the project manager that the acquisition will not influence the environmental assessment of the project including the "no build" alternative. All requests to the Right of Way Section for protective acquisition should document that prompt acquisition is required to prevent development of property that could cause higher acquisition and construction costs and relocation of people and businesses, if deferred. Any requests for protective buying should be reviewed and approved by the district Corridor Preservation Committee, or if one does not exist in your district, approval by appropriate district management prior to submittal to Right of Way Section. The Right of Way Section will coordinate with the FHWA in obtaining concurrence in the approval for hardship and protective buying on projects with federal participation in right of way. Do not proceed with acquisition of any hardship or protective purchase parcels until written concurrence is received from the Right of Way Section. Upon approval from the Right of Way Section for a hardship or protective buying parcel, every effort should be made to appraise and acquire the property with a minimum of delay and consistent with normal acquisition procedures. A categorical exclusion determination (CE) must be completed in accordance with instructions in EPG 236.3.1.2. If the parcel has been included in a RES (Request for Environmental Services) a CE will not be required. Past experience has shown that hardship and protective purchases have not resulted in significant environmental effects and that this experience has resulted in categorical exclusions being granted by FHWA in accordance with 23 CFR 771.117(d)(12). MoDOT was granted approval by FHWA on June 9, 1994, for programmatic categorical exclusion for these purchases in accordance with 23 CFR 771.117(e). The result of this is that we will not need to request concurrence from FHWA in categorical exclusions for future hardship and protective purchases. Should negotiations for a hardship or protective buying parcel fail, condemnation action in compliance with the Uniform Act will be instituted insofar as permitted by Missouri state law. Section 227.050, RSMo, requires the Chief Engineer to submit to the Commission in writing the Chief Engineer's recommendations as to detail plans with the right of way and surfaced roadway and type and character of construction for the highway. The statute provides that the Commission may approve, disapprove or modify the plans and proposals as recommended and the action of the Commission will not be disturbed except by subsequent action of the Commission. Supreme Court Rule 86.04 requires that when a condemnation petition is filed for the acquisition of right of way for a highway improvement, the detail plans required by Section 227.050, RSMo, shall be filed with the Circuit Clerk. This is necessary in order to confer jurisdiction on the court. Because of this, the department in many instances would not be in a position to institute condemnation proceedings immediately for the acquisition of hardship cases. In most instances, if the project has progressed to a point that detail plans can be approved by the Commission and filed with the court, the department is at a point of normal right of way acquisition. See EPG 236.13.14.2 Right of Way Obtained by Condemnation for additional information. Prior to instituting condemnation of a hardship or protective buying parcel, the district right of way manager shall discuss with regional counsel and the Right of Way Section to determine if plans are adequate to allow for condemnation to proceed and to review offer data that is pertinent to the parcel. If all or any portion of an employee’s or commissioner’s property is needed for a project the following process must be followed. An employee or commissioner-owned property is defined as any property or property interest held by an employee or commissioner wherein the individual will directly receive financial gain from the acquisition transaction. Instances where the individual is merely a corporate officer, or the interest to acquire is deed of trust held by a financial institution owned or directed by the employee or commissioner, may be handled as a normal acquisition. Should you be made aware of a situation of an owner that is an immediate relative of an employee or commissioner, the Right of Way Section will advise if the acquisition requires application of this policy. A summary of pertinent details (right of way plan sheet, facts about the employee, copy of scope of assignment (i.e. Fee Study), and other related facts) about any proposed acquisition of employee-owned property or property rights must be submitted to the Right of Way Section for the Asst. to the State Design Engineer - Right of Way’s approval prior to proceeding. Should the acquisition appear to be of a routine nature with no apparent significant conflict, the Asst. to the State Design Engineer - Right of Way will recommend the policy listed below for employees and employees need not be encouraged to go to condemnation. Acquisitions, which have been determined to be $10,000 or less, may be valued by MoDOT staff and may be reviewed and just compensation approved by the Right of Way Manager or certified appraiser . The Right of Way Section will secure administrative review of all valuations with values less than $10,000 from the Federal Highway Administration prior to an offer being made. Commission approval is not necessary to extend the approved offer to the employee. Acquisitions of more than $10,000 will have a fee appraiser or appraisers determine compensation. The appraisal will be reviewed and just compensation approved by the Right of Way Manager and a certified appraiser. The Right of Way Section will secure administrative review of all appraisals with values greater than $10,000 from the Federal Highway Administration prior to an offer being made. Commission approval is not necessary to extend the approved offer to the employee. The approved offer will then be extended to the employee and if the offer is for $10,000 or less, they can accept the approved offer. Any administrative settlement requires approval by the Asst. to the State Design Engineer - Right of Way. If the offer is for more than $10,000, the employee can accept the approved offer. Any administrative settlement requires approval by the Assistant Chief Engineer, Assistant Chief Counsel - Project Development and the Asst. to the State Design Engineer - Right of Way. The offer to mediate needs to be extended to employees. The MoDOT representative at the mediation session should be from the Right of Way Section or another district right of way office. Should the acquisition appear too controversial or cause conflict, the Asst. to the State Design Engineer - Right of Way will advise the district to proceed with the policy listed above with the added provision the employee should be encouraged to go to condemnation. Prior to condemnation of an employee, submit the appraisal, negotiator’s report, and other pertinent information to the Right of Way Section. The Assistant Chief Engineer, Assistant Chief Counsel - Project Development and the Asst. to the State Design Engineer - Right of Way will determine if a settlement or condemnation will be used. The following conflict of interest policy must be followed for any acquisition from a commissioner of the Missouri Highways and Transportation Commission (MHTC). When a member has any possessory interest in real property for which an offer of just compensation will be made so that it may be acquired by MHTC for a project, the following procedure should be used by the commission member and shall be followed by MoDOT staff and special conflicts counsel. The district will have a preliminary estimate of damages in a fee study. If in the fee study, the apparent compensation is estimated to be $500 or more, the district’s right of way unit will have one or more fee appraiser(s) determine just compensation for the property to be acquired and the damage, if any, to the property’s remainder. If the apparent compensation in the fee study is less than $500, the appraisal will be prepared by district staff appraiser(s) and approved by the right of way manager. The Asst. to the State Design Engineer - Right of Way will also secure review and approval of the appraisal(s) and the approved offer of just compensation from the Federal Highway Administration. When the approved offer exceeds $500, Section 105.454 (2), (3) RSMo. requires public notice before the sale of real property. Therefore, the Asst. to the State Design Engineer - Right of Way shall place the matter on MHTC’s open session meeting agenda for the Commission to review and finally approve the offer of just compensation (with the affected member abstaining from discussion and voting) prior to the offer being made to the commission member. To provide adequate public notice, the agenda item shall be styled: “Purchase of Real Property Interest from Commissioner _________.” However, if the approved offer does not exceed $500, MHTC review and approval is unnecessary. The approved offer will then be made by the district’s right of way office to the member, or his/her authorized representative. However, the member will be encouraged to refuse the offer and go through condemnation (to avoid any appearance of impropriety or undue influence by the member over the staff or other MHTC members) if the offer is more than $10,000. Provided further; however, if the offer is $10,000 or less, the member need not be encouraged to go through condemnation and may execute a deed for the real property in exchange for the approved offer. If the MHTC member agrees to the condemnation, the parcel will be condemned at the first opportunity by special conflicts counsel approved by MHTC (with the affected member abstaining from discussion and voting). Once the condemnation commissioners appointed by the circuit court have set a value for the property, if that value is acceptable to all parties, a proposed settlement in the amount of the condemnation commissioners’ award should be presented to the court for its review, approval, and entry of judgment, but the court shall be requested by special conflicts counsel to delay its action until after the members’ term ends (to avoid any appearance of impropriety or undue influence by the member over the staff or other MHTC members). Should either party not agree with the value established by the condemnation commissioners and file exceptions to the condemnation commissioners award, the special conflicts counsel should prepare the case for trial, but shall request the circuit court to delay the jury trial until after the commission members’ term expires (to avoid any appearance of impropriety or undue influence by the member over the staff or other MHTC members). The final price for the property will be that determined by jury verdict and the court’s final judgment after appeal, if any. Should the circuit court refuse under section (2) (I) 8. or 9. above to delay the action under Missouri Supreme Court Administrative Rule 17, the special conflicts counsel shall consult with MHTC in closed meeting regarding the appropriate course of action (with the affected member being excluded from the meeting). The proper accounting and recording of all expenditures and income occurring as a result of right of way transactions are the responsibility of the Financial Services Division. In order for the Financial Services Division to carry out its responsibility, it is necessary for the district right of way office and the Right of Way Section to cooperate by supplying and interpreting essential information needed for accurate cost accounting. Although the Financial Services Division is responsible for recording all expenditures and income as a result of right of way transactions, it will be necessary for each district right of way office to maintain such additional record keeping as is necessary to furnish the required managerial reports and statistical data requests. These additional records may be maintained at each district's discretion so long as they are sufficient to furnish the needed information. Refer to the SAM II Chart of Accounts for coding instructions on right of way transactions. The following sections will describe right of way policy and procedure in regard to expenditure authorization and control. Financial Services Division establishes one or more unique accounting number(s) for each right of way project when an A-Date is issued. This accounting number is termed the SAM II Project Number. The SAM II Project Number is available to district and division users by querying the SAM II system, and is also maintained on the Job List in RWPA. The district right of way office will forward, along with the correct accounting coding, all required documentation and data for right of way payrolls and relocation claims (payments) to the Right of Way Section. Documentation required for processing payment for land acquisition by negotiation shall include a certified escrow agreement or certified sales contract, Legal Description, Exhibit A, and a right of way Acquisition Payment (Form (A-419) for each parcel. If an administrative settlement is reached the administrative settlement memorandum is a required attachment. Documentation required for processing payment for a temporary or permanent easement shall include a fully executed easement agreement and an administrative settlement memorandum. In order for a check to be issued or electronic funds transfer to occur the payee must have a vendor number. This vendor number can be obtained by filling out the Vendor Input/ACH-EFT Application Form provided by the Office of Administration (OA) and submitting that form to OA. The payroll packet may be submitted through inter-office mail or by emailing scanned “pdf” files. All required documentation is still required. Once the Right of Way Section reviews and approves the payment the Right of Way Section will submit the payroll to the Financial Services Division. Commission approval must be obtained prior to payment of land acquisition for maintenance sites, resident engineers' offices and district office sites. Expenditures for incidental expenses such as commercial invoices, time charges, equipment rental, subsistence expenses, pro rata tax, prepayment mortgage penalty payments and bill of cost shall be forwarded to the Right of Way Section for review and delivered to Financial Services Division, Accounts Payable Section. Checks in payment of right of way regular land purchases, commissioner’s awards, final judgments and relocation assistance payments are forwarded to the district for delivery to the payee. As part of the accountability statute, MoDOT is required to prepare a comprehensive financial report to be audited by an independent certified public accountant. The financial report must conform to generally accepted government accounting principles. Since fiscal year 1998, MoDOT has prepared yearly financial reports and each has been audited by independent certified public accountants. This financial report is included in the yearly accountability report presented to the legislature in November. In addition, as required by the bond covenants, this yearly audited financial report is submitted for continued disclosure requirements associated with the bonds issued by the department. The results of the yearly audit continue to assist in issuing bonds at low interest rates. To comply with generally accepted government accounting principles, MoDOT must follow all standards issued by the Governmental Accounting Standards Board (GASB). The GASB is continually issuing standards to establish accounting and financial reporting requirements to reduce inconsistencies and increase comparability among state and local governments. GASB statement 51, accounting and financial reporting for intangible assets will be complied with by MoDOT. Intangible assets include permanent and temporary easements. Detail is needed when processing right of way payments and MoDOT must have the ability to report and track these permanent/temporary easements from the time of acquisition to disposition. This also includes non-cash acquisitions. Easements meeting the following two criteria are to be recorded with the appropriate fixed asset (FA) type. 1. They are MoDOT assets. 2. They are estimated to exist more than one year. All easement acquisitions are estimated to exist more than one year for accounting purposes. Permanent Easements and Utility Easements have their own Fixed Asset Type, while Temporary Easements will have a different Fixed Asset Type. Financial Services will update the general ledger fixed asset account-Permanent Easements and Utility Easements (1705) or Temporary Easements (1707) at the time the payment is processed. To affect the general ledger accounts, district right of way will enter the appropriate Fixed Asset Type on the payroll document (A-419). The Fixed and Utility Asset Types are "P" for Permanent Easements and "O" for Temporary Easements. "Regular purchases" will continue to have a Fixed Asset Type of "R". DONATIONS: Donations of any permanent easement or temporary easement must be accounted for in the database Right of Way Parcel Acquisition (RWPA) as usual. A value MUST be placed on these donations by individual easement type. While a full-blown valuation is not required, documentation of the estimated value(s) must be placed in each parcel file for audit purposes. Once a month and prior to submittal of any reports on this information to Financial Services, Journal Vouchers (JV) will be requested by the Right of Way Section for newly documented donations of permanent or temporary easements. To facilitate reconciliation to Financial Services general ledger and to respond to internal, financial and state auditor questions, the Right of Way database RWPA contains detail related to all easements. The RWPA database is updated to include all necessary information and will be balanced against the general ledger. Once a month Financial Services will be provided a report with applicable information for the prior month, year to date and inception to date. Appraisal and waiver valuation formats account for individual allocation of easement values for use in documenting the individual easement payroll items. Appraisal Review and Approval of Just Compensation (Form 6.4.3) and Adjustment to Value or Just Compensation (Form 6.4.4) will reflect these individual easement items under Damage to Remainder. 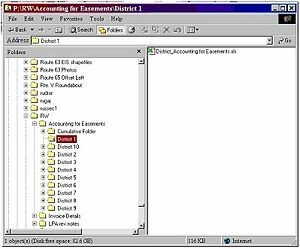 To access the "Accounting for Easements" folder for your district you must have access to the Central Office "Public Drive", noted below. You should now be at the "Control Panel" box. 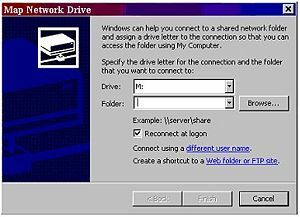 From the Menu Bar select "Tools"
From the drop down select "Map Network Drive"
If you successfully mapped to the network drive a box will appear as below. You may close out of this box by clicking the "x" button. If you were unsuccessful in the process, contact your local district information system staff for assistance. Scroll down to the "RW" folder, click the expand button. Next click to expand the “Accounting for Easements” folder. Double click on your District’s folder to access the Excel spreadsheet you will be completing for your district. The following provides additional information necessary for right of way to comply and meet the MoDOT needs in respect to these requirements. Acquisition Payroll Form (A-419) includes a detailed breakdown of the payroll including lines for Permanent Easements and Temporary Easements. Also an Excel spreadsheet will be the interim subsidiary ledger for easements that contains all the information Financial Services needs. District right of way will need to maintain this spreadsheet beginning with payroll data on permanent and temporary easements payrolled January 1, 2009 and until such time as the RWPA database(s) can accommodate all the information necessary. The district spreadsheets are available on the Central Office Public Drive (directions for mapping to the p:drive are available, to the right). 1. If a payroll involves splitting the payroll into multiple payees (which requires two separate A-419's) then the entry in the "accounting for easements" spreadsheet should also be "split" into the number of transactions with the appropriate value for the easement type broken out separately. For example. An acquisition of a temporary easement valued at $700 in which two owners want to be payrolled 1/2 each would require two lines of entry on the "accounting for easements" spreadsheet one each for $350 dollars in value. The acreage would not need to be split but rather one would have the entire acreage and the other left blank. This will allow for the controller to enter two different SAM II transaction numbers and appropriate SAM II transaction dates on the spreadsheet. 2. If an easement type is valued at $0 DO NOT include it on the payroll document (A-419) and thus DO NOT attempt to code in the code block of the payroll form A-419 for the $0 value easement. However, it must still be documented on the spreadsheet as an easement acquired with $0 value. Financial Services will then need to review the quantity of $0 values to determine the materiality under the GASB Standards. This will be a moving target as we move forward but until a final determination is made we will comply with Financial Services's current request. 3. When documenting the permanent and temporary easements within the appraisal formats (allocation section) and the appraisal review forms remember to add all the various permanent easements together and temporary easements together and report only a single quantity and value for each type. These should then be documented the same way on the spreadsheet (with the exception of # 1 above when the payroll (value) is to be split between multiple payees). For example. The acquisition consists of a permanent drainage easement, .10 acre, valued at $1,000 permanent utility easement, .50 acre, valued at $5,000 temporary easement, 1.0 acre, valued at $100. These would be payrolled/reported as permanent easement, .60 acre, at $6,000, fixed asset "P" and temporary easement, 1.0 acre, at $100, fixed asset "O". NOTE: IT HAS BEEN NOTICED THAT RWPA DOES NOT ALWAYS MATCH WHAT IS BEING ENTERED ON THE SPREADSHEET FOR THE AREA “ACQUIRED”. THE TWO SHOULD EQUAL, UNDERSTANDING THAT RWPA ALLOWS FOR PERMANENT UTILITY EASEMENTS TO BE ENTERED SEPARATELY. 4. If there is a combination acquisition of permanent and temporary easements ONLY the fixed asset type for any administrative settlements/homestead/heritage amounts should have a fixed asset "P", again, only if there are NO "R" fixed asset payments included. If there are fixed asset "R" (regular purchase) coding, then the administrative settlements and/or homestead/heritage amounts would have a fixed asset "R". If the acquisition is a permanent easement OR temporary easement ONLY, then any administrative settlement/homestead/heritage payments would be coded with a fixed asset "P" or "O" as appropriate, even if the easement had a value of $0 and was not included on the payroll (See # 2 above). 5. Access rights only acquisitions, including any administrative settlements or homestead/heritage payments associated with an access rights only acquisition, should be coded fixed asset "R". Right of way expenditures are controlled as follows. (b) Authorized funds shall not exceed Statewide Transportation Improvement Program (STIP) as of the date of authorization. (c) Regular purchase right of way, uneconomic remnants, excess land and borrow acquisition payments shall not exceed amounts established by approved Form 6.4.3, Form 6.4.4, district-approved payment estimate (waiver valuation) form, or administrative settlement memo. (d) Expenditures for acquisition by eminent domain shall not exceed the amounts as established by court-approved commissioners' report, court-approved jury settlement or stipulated legal settlement. (e) All other incidental expenditures shall be controlled in accordance with approved contracts, agreements or special Commission minutes. The MHTC authorizes expenditures for right of way acquisition and relocation payments when it approves the 5-year STIP or through STIP amendments. Right of way expenditures; such as, pro rata tax, mortgage prepayment penalty, fee appraisal cost, title contract fees and other incidental expenditures will be paid by commercial invoice process as specified by the FMS Financial Policies and Procedures Manual. Certain right of way expenses can be authorized and paid from the Design/Bridge Consultant (DBC) budget organization. Eligible expenses are for payments to consultants under contract with MoDOT for Title Services, Real Estate Appraisals and Reviews, Mediation and Negotiation. A copy of any contract to be funded by the DBC budget should be forwarded to the transportation project manager in the Design Division responsible for the DBC, and to Financial Services, Accounts Payable (Contractual Payments) at the Central Office prior to requesting payment on that contract. This provides the ability to track contracts for reporting to legislature. Approved invoices with appropriate coding should be forwarded to Financial Services, Accounts Payable (Contractual Payments) at the Central Office for processing. The district right of way office has full responsibility for contract administration and must certify each invoice as being due and payable under the terms of the contract. Please note that the above coding provides a different object/sub-object for title work depending on whether the project is a “P-phase” or “R-phase”. This is because object 2820 requires a fixed asset and a fixed asset requires an R-phase project number. Charges to both objects are capitalized, but those to 2544 are capitalized later in the accounting process. Annually a budget is prepared for the Design/Bridge Consultant org code with input from the districts. It will be necessary for each district right of way office to include its estimated funding requirement with the district submittal. This may be included as a component of the Design Division figure, or may be shown separately. There will be no change to district operating funds allocations as a result of this change. The Federal-Aid Program is funded with a portion of federal aid highway funds. These funds must be expended on improvements to certain designated public highways. The public highways that qualify for this program must qualify for federal aid and be under jurisdiction of and maintained by a public agency and open to public traffic. The Bridge Program is funded with an established portion of the federal aid highway funds. These funds must be expended on improvements to a public road, street, or highway. The public roads that qualify for this program must be under the jurisdiction of and maintained by a public agency and be open to public traffic. The right of way procedures for federal-aid projects must be in compliance with requirements 23 CFR and 49 CFR. A document entitled Local Public Agency Land Acquisition has been developed and is available to provide guidance to local agencies with regard to right of way acquisition. Public Highway: Any alley, street, road or highway under the jurisdiction of and maintained by a public agency and open to public traffic. Public Agency: Any county, municipality, state or local political subdivision, or governmental agency. In the following subarticles of EPG 236.3, these public agencies will be referred to as "local agencies." The Missouri Department of Transportation has the overall responsibility for the acquisition of right of way on all federally assisted right of way projects in the state of Missouri. If the LPA is not requesting federal aid in the right of way phase of a project the district shall provide a Notice to Proceed to the LPA rather than an A-Date. Local agencies may acquire necessary right of way on projects within the political subdivision of their jurisdiction provided they are adequately staffed, equipped, and organized to provide such services to comply with requirements of 23 CFR and 49 CFR. It shall be the district's responsibility to fully inform the local agency of its responsibility to comply with the requirements of 23 CFR and 49 CFR when acquiring right of way in conjunction with a federally assisted highway project. The local agency must be informed of these responsibilities prior to executing the supplemental project agreement and the agreement shall contain and set out the conditions of acquisition and funding for any necessary right of way. The district shall make a determination whether the local agency is adequately staffed to perform the necessary right of way functions. It should also determine if it would be practical to maintain a staff to perform these functions. These determinations are reported on appendix item 2B of the LPA Land Acquisition when requesting acquisition authority. If the local agency is not staffed adequately to perform all or any part of the right of way functions, contracting these functions is permitted. Contracting and contract documents are covered in Local Public Agency Land Acquisition. When a local agency is not staffed to perform all or part of the right of way functions, it may request that the state perform all or part of these functions for the agency. The district should evaluate their program and schedule to determine if performance of this work would interfere with their own work. If approved by the district right of way office to provide this assistance, an agreement should be prepared between the agency and the state to provide these services and shall set out the conditions for reimbursement of the state's cost to provide the agreed services. Local agencies must follow state procedures as contained in this manual and the LPA Manual or develop their own procedures that must comply with Titles 23 and 49 CFR. Such procedures must receive prior approval by MoDOT and FHWA. When right of way for a local agency project is acquired by other than state forces, the district shall monitor all phases of the acquisition by the local agency or its contractor to assure compliance with 23 CFR and 49 CFR. Monitoring should begin early in any phase of right of way activities to assure compliance and to avoid potential nonparticipation. The monitoring function also includes the condemnation phase if undertaken by the local agency. It is the district right of way office’s responsibility to notify the local agency that proper documentation must be made for not filing exceptions to awards, for justification for settlements, and for trial reports. The requirements for documentation are established in Local Public Agency Land Acquisition. The district right of way office shall obtain copies of all justifications and/or trial reports and furnish copies to the regional counsel for their review. Counsel's review will be furnished to the district right of way office for attachment to the project monitoring report. In case of inadequate documentation, counsel shall contact appropriate representative of local agency for corrective action. The district shall prepare a monitoring report of the local agency's performance or its contractor's performance for each phase of the right of way function. When it is determined that each phase of the right of way function is in sufficient compliance, the original monitoring report shall be retained in the district files with one copy forwarded to the division office along with the clearance certification. A copy of the monitoring report can be found in Local Public Agency Land Acquisition. If the district determines that the local agency is not in sufficient compliance to qualify the project for federal aid, the district should work with the LPA to attempt to resolve the discrepancy. If the discrepancy cannot be resolved the district shall notify the Right of Way Section. When appropriate the Right of Way Section will confer with the Federal Highway Administration on the deficiency and notify the district of any further action necessary. In order to receive federal participation, all projects including those involving acquisition of additional rights of way must be programmed with the Federal Highway Administration. Project authorization (acquisition authority) must be received from the Right of Way Section prior to incurring any expenditure for acquisition on projects where the department or local agency anticipates federal-aid participation. Before acquisition authority is issued, the district right of way office shall check for environmental classification approvals. Therefore, MoDOT and local agency must decide if they desire federal participation in the right of way phase of a project prior to making appraisals, negotiations, and actual relocation assistance payments. Acquisition authority should be requested from the Right of Way Section office by using the information contained in the Local Public Agency Land Acquisition. All information on said form shall be furnished along with any pertinent remarks to explain the planned right of way acquisition. When department personnel are to acquire right of way for a local agency, it will be necessary to request authorization from the division office before proceeding with the work regardless of the funding on the project. If the local agency is not requesting federal participation in right of way costs, the district can authorize the local agency to begin acquiring or getting donations by approving the agencies submittal as outlined in the Local Public Agency Land Acquisition. This action would follow the district's review of plans and a check on the approval of the environmental classification. Concurrent with project authorization, funds must be obligated for the total estimated cost of the work being authorized. If actual costs for authorized work exceed estimated costs, the district right of way office must submit a request for a modified project agreement to the Right of Way Section. A clearance certification as set out in EPG 236.18.10 Local Public Agency Land Acquisition shall be submitted to the division office when the local agency or department personnel have acquired all necessary right of way for a project. Unless state forces acquire the right of way, the local agency shall submit to the district the required statements of certification on their letterhead, and signed by appropriate official or officials as outlined in EPG 236.18.10 Local Public Agency Land Acquisition. The district submits this certification along with their monitoring report indicating the acquisition qualifies for federal participation to the Right of Way Section. The district shall submit a right of way clearance certification to the Right of Way Section office for all projects that involve any type of real property right being conveyed to MoDOT including temporary and/or permanent easements and/or access rights and/or right of way. It may also be necessary to submit a clearance certification on a portion (partial clearance) of a right of way project or a conditional clearance when the department's construction letting schedule indicates a need to do so. The district right of way office should maintain close surveillance of the department's construction letting schedule to assure timely right of way clearance. A right of way clearance certification is required for all right of way projects regardless of funding. A right of way clearance certification is required on all federally funded local public agency projects. The local agency shall submit a clearance certification to the district on the agency's letterhead signed by appropriate official or officials. This certification, along with a monitoring report, shall be submitted to the Right of Way Section. The District Right of Way Manager shall submit a right of way clearance certification to the Central Office Right of Way Section for all projects that have right of way funding programmed in the STIP. If the District Project Manager and the District Right of Way Manager determine no right of way, easements and access rights are required for the project, the District Right of Way Manager will submit a right of way clearance certification. The clearance certification will indicate no right of way, easements or access are required for the project and the Project Manager must sign the clearance certification. The District Right of Way Manager will submit the signed clearance to the Central Right of Way Liaison at least seven weeks prior to the project letting date. Clearance certification should be submitted when all right of way has been acquired and legal and physical possession of all parcels has been obtained and relocation assistance has been made available on occupied units. No later than approximately 10 weeks (PS&E due date) prior to the scheduled construction letting date of a project or portion of a project. All jobs certified clear more than one year prior to construction letting must have an updated clearance certification issued to verify that the right of way is still clear and that there are no encumbrances of any kind and there are no rental agreements, extensions of possession or leases in effect. The submittal of the clearance certification shall be by email to the Asst. to the State Design Engineer - Right of Way, Right of Way Section with all appropriate attachments, including the certification letter, a copy of the right of way plans as acquired and the acquisition complete cost estimate. Each certification must contain the following. construction job number and termini. 2. Make all of the statements depending upon type of acquisitions involved for project. We certify that all necessary right of way, easements and access rights have been acquired in accordance with the Titles 23 and 49 CFR. Legal and physical possession of all parcels has been obtained. The steps relative to relocation advisory assistance and payments were not required. We certify that all necessary right of way, easements and access rights have been acquired in accordance with Titles 23 and 49 CFR. Steps relative to relocation advisory assistance and payments as required by 49 CFR, Part 24 have been taken (personal property moved only). Steps relative to relocation advisory assistance and payments as required by 49 CFR, Part 24 have been taken. All individuals and families have been relocated to or offered equivalent decent, safe and sanitary housing in accordance with 49 CFR, Part 24. Required data to be submitted with clearance certification. Attach to the clearance certification for any local public agency project a separate sheet indicating the number of parcels on the project, the number of parcels requiring condemnation, also indicate whether state personnel or local agency personnel acquired the necessary right of way. If local agency acquired, attach a copy of the district's monitoring report indicating that the acquisition was in compliance with department and Federal Highway Administration policies and procedures for acquisition and relocation assistance. The monitor checklist is included in Local Public Agency Land Acquisition. As utility adjustments are generally the responsibility of the District Utility Engineer, it will not be necessary to make comment in regard to utilities in a right of way clearance certification. However, utility easements that are acquired by MoDOT on behalf of utility companies and included in the right of way acquisition for the project should be considered in your clearance certification. The original certification should be directed to the Asst. to the State Design Engineer - Right of Way, Right of Way Section through notification to the email group RWPayments, that all documents are loaded into RWPA Media. If the acquisition involves an outdoor advertising billboard sign, copy the outdoor advertising specialist in the appropriate district. Other copies may be distributed as necessary at the district level. The clearance certification as well as all appropriate attachments, including a copy of the right of way plans as acquired and any other applicable documentation, should be loaded into RWPA Media and an email sent to the group titled RWPayments, requesting review and approval of clearance request. The Right of Way Section will review the clearance certification submitted by the district and once approved will submit an approval email to the Requestor, RWPayments group, Financial Services and, when appropriate, the FHWA. The Right of Way Section will place the Approved Right of Way Clearance Certification in eProjects. District Right of Way will forward the Approved Right of Way Clearance Certification to the Project Manager. Should it be necessary, to allow MoDOT to meet a construction letting schedule, it is possible to issue a right of way clearance certification on a project prior to actually having legal and/or physical possession of all of the necessary right of way. This particular type clearance certification is to be issued only under very unusual circumstances, when it is considered to be in the public's best interest to proceed with the letting and the number of parcels the department does not have possession of is minimal. Explanation as to why it is in the public's best interest to clear the right of way. The department will ensure that occupants, who have not yet moved from the right of way, will be protected against unnecessary inconvenience and disproportionate injury or any action coercive in nature. The conditional clearance shall include a statement that a follow-up clearance certification will be issued when possession of all parcels has been obtained. FHWA must review and approve all conditional clearances prior to submitting to Financial Services. When phase construction is involved on a particular project and it is necessary to clear only a portion of an entire right of way project, all other requirements for the issuance of a clearance certification are applicable, except EPG 236.3.7.6. In addition, the following specific information shall be provided. As noted in EPG 236.3.7.3, paragraph 1, first bullet, the clearance certification should clearly state that the clearance is only for a portion of the entire project. Termini of the entire right of way project and the termini by stationing of the portion of the project being cleared, as noted in EPG 236.3.7.3, paragraph 1, sixth bullet. In addition to the information required by EPG 236.3.7.3, paragraph 3, the total number of parcels located within the termini of the partial clearance shall be provided and each parcel listed by number. Due to the nature of a design-build project that allows overlapping of design and construction phases, each design-build project will have a conditional clearance and entire clearance. As soon as the project is awarded, a conditional clearance certification will be submitted to the Right of Way Section by the district. The conditional clearance will certify that all realty rights will be acquired in accordance with the Uniform Act. District Right of Way will provide periodic parcel updates to the project director. Once all right of way is cleared an entire clearance certification shall be submitted to the Right of Way. RSMo. Section 226.690 provides that any junkyard that was lawfully in existence on August 4, 1966, which is within 1,000 feet of the nearest right of way line of any interstate or primary highway and is visible from the highway must be screened so as to render it not visible from such highway. Junkyards may be screened either by structural fencing such as wood, concrete, metal, earth berm, or non-deciduous vegetation. When it is not economically feasible or possible to screen junkyards, the department may acquire either by negotiations or condemnation a restrictive easement to the rear property line or to a depth of 1,000 feet from the right of way line. When new right of way for a project is acquired and renders a legal junkyard nonconforming, it is the Missouri Department of Transportation's obligation to bring it back into compliance by (1) screening, (2) relocating, or (3) purchasing. A junkyard is considered a business and if displaced is entitled to appropriate and applicable relocation assistance benefits. not visible from the right of way of the interstate or primary system. RSMo. Section 226.690 provides that any junkyard that was lawfully in existence on August 4, 1966, which is within 1,000 feet of the nearest right of way line of any interstate or primary highway and is visible from the highway must be screened, if feasible, by the Missouri Department of Transportation so as to render it not visible from such highway. When it is determined by the Missouri Highways and Transportation Commission that adequate screening is not economically feasible or possible, it is authorized to acquire by purchase, exchange, or condemnation proceedings the lands necessary to secure the relocation or removal of said junkyard. The Commission may acquire such lands as necessary to provide adequate screening of such junkyard when it is considered to be in the best interest of the state. (4) junkyard is within 1,000 feet of the nearest right of way line and is visible from the interstate or primary system. For a junkyard within 1,000 feet of the right of way of an interstate or primary highway to have been legal on August 4, 1966, it must have been in existence and thereafter applied for and received a license. To be licensed it must have been in a municipality or either screened from view or back at least 200 feet from the highway. When a junkyard meets the above requirements, it must be screened or otherwise brought into compliance with the law by the Missouri Department of Transportation. When new right of way for a project is acquired and renders a legal junkyard nonconforming, it is the Department's obligation to bring it back into compliance by (1) screening, (2) relocating, or (3) purchasing. When feasible, junkyards may be screened either by structural fencing such as wood, concrete, metal, earth berm, or non-deciduous vegetation. Vegetation must be of such density as to screen the junkyard from sight of the traveling public within a three-year period after initial planting and be of a variety that will screen the junkyard from view the year round. MoDOT will design and contract to build the screen or contract with the owner to construct the screen, providing that he constructs it in accordance with the state's specifications. Easements may be acquired by either negotiation or condemnation. The negotiated agreement or the condemnation petition must include height restrictions to assure that junk will not be placed in such a manner as to be visible above the screen. It is preferable that the property owner maintains the screen as a part of his agreement with the department. If the owner refuses and the screening easement is condemned, the maintenance will become the department's responsibility. It is not feasible to construct a screening fence to a height greater than 8 feet. Earth berms may be constructed to increase vertical height. When it is not economically feasible or possible to screen junkyards, the department may acquire either by negotiations or condemnation a restrictive easement to the rear property line or to a depth of 1,000 feet from the right of way line, whichever point occurs first. Appraisals for such restrictive easements shall be compiled in accordance with current right of way or realty appraisal policies. When negotiating, if there is a sufficient remainder, the owner should be encouraged to retain the items to be removed to the remainder at their salvage values. If this can be accomplished, the Chief Counsel's Office will prepare a restrictive easement and an escrow agreement withholding a specific amount as a performance bond to be released when the salvage is removed from the 1,000 ft. restrictive easement. When the owner does not retain the salvage, bids will be taken on the basis of the successful bidder buying and removing all junk. The successful bidder will be required to furnish a surety bond. Contract and bid documents will be prepared and furnished. If and when negotiations fail, the Chief Counsel's Office will then condemn a restrictive easement. Upon clearance, the same methods to remove the junk will be used as when the property is purchased by negotiation. A junkyard is considered a business and, if displaced, is entitled to appropriate and applicable relocation assistance benefits. (1) Determine the legality of the junkyard; i.e., zoning and validation of legal status. (2) Determine if junkyard can be screened. (a) The department can acquire easements at various angles to the right of way line for screening purposes either by negotiation or condemnation. (b) A reasonable height for man-made screening is approximately 8 feet. (c) Earthen berms may be used for screen or to increase the vertical height of vegetation or fence. (d) Consideration should be given to recycling of scrap where practicable and screening the remaining area. (3) Pictures can be used to document file. (4) Develop plan sheet to show complete ownership, 1,000 ft. line, and area under permit with relation to highway, setting out elevation needed to screen; include general location of junk and any buildings, structures, or improvements involved and suggested method of screening. (5) If it is not feasible or economical to screen, develop an appraisal for junkyard removal including 1,000 ft. restrictive easement (assistance in making such appraisal can be requested from division office). (6) The Chief Counsel's office in Jefferson City must be contacted to prepare the conveyance and escrow agreement. NOTE: Each and every conveyance or agreement must be approved as to form by the Chief Counsel's office. (7) If the owner retains the salvage (which MoDOT prefers), a sufficient amount must be retained by Commission to assure removal of such items. In those instances where owner retains the salvage, he must contract with the Commission that a replacement site for a salvage yard operation is available to him. (8) Sufficient documentation should be compiled to justify the acquisition. Estimate the cost of screening, if feasible, and estimate cost of 1,000 ft. restrictive easement including the removal of the junk. Document the file in accordance with the above guidelines and make a recommendation to the Right of Way Section along with the request for authority to proceed. Additional information is contained in EPG 236.17 Junkyards. Just compensation will be paid to the outdoor advertising sign owners and site owners. The owner of the structure will be given the opportunity to salvage the structure. Federal funds participate in 80% of the cost of removal of nonconforming outdoor advertising structures. When nonconforming outdoor advertising structures are removed through this nonconforming acquisition program, just compensation will be paid to the outdoor advertising sign owners and site owners for the rights and interests that are considered to be nonconforming on the interstate system and primary highway system as it existed June 1, 1991. Signs lawfully erected prior to March 31, 1992, in areas zoned commercial or industrial or in unzoned commercial or industrial areas that are nonconforming solely because they do not comply with the size, lighting and spacing requirements of the present law do not have to be removed under this program. (3) demolition contract or removed by MoDOT maintenance personnel. Federal funds participate in 80% of the cost of removal of such nonconforming outdoor advertising structures if funded as a transportation enhancement project. However, it is the states discretion as to whether it wishes to acquire nonconforming outdoor advertising structures utilizing transportation enhancement funds. The Revised Statutes of Missouri, Sections 226.500 through 226.600, regulate and control outdoor advertising adjacent to the interstate system and primary highway system to promote highway safety, convenience and enjoyment of highway travel, and to preserve the national scenic beauty of highways and adjacent areas. Outdoor advertising shall not be erected on the primary highway system as it existed June 1, 1991, and the interstate system unless said outdoor advertising sign is erected in accordance with the provisions of RSMo. Sections 226.500 through 226.600. The Outdoor Advertising Section of the Right of Way Section has an inventory of all signs and is charged with the responsibility of keeping the inventory current as well as issuing permits for all lawfully erected outdoor advertising signs requiring permits. Please refer to EPG 236.10.7.4 Written Notice for detailed information. The following information relates to all services provided under contract including, but not limited to, title services, appraisal services, negotiation services, relocation services and mediation services. Business entities and employers are prohibited from knowingly employing, hiring or continuing to employ illegal aliens to perform work in Missouri. Participation in the federal work authorization program E-Verify, which enables employers to electronically verify employment eligibility, is required for all public employers and business entities receiving a state contract or grant in excess of $5,000 or a state-administered tax credit, tax abatement, or loan from the state. Participation in a federal work authorization program is an affirmative defense to an allegation that a business entity knowingly hired an illegal alien. Participation in this federal program is accomplished through the Department of Homeland Security E-Verify website. 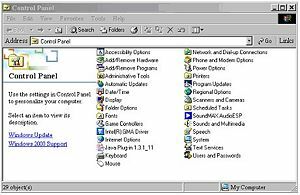 There is a tutorial of the program and a survey that must be completed. Once the survey is completed, the electronically signed Memorandum of Understanding verifying program participation will be given. Contractors or potential contractors may also contact the Department of Homeland Security at 1-888-464-4218 for specific questions regarding the E-Verify program. - the first page and signature page(s) of the E-Verify MOU the business has with the Department of Homeland Security (electronic signatures are acceptable indicating BOTH parties electronically signed the document). The business entity should be able to provide the entire Memorandum Of Understanding document if requested. If the proposed contractor is a sole proprietor with no employees, presentation of a copy of the sole proprietor’s drivers license or other document as affirmative proof of their eligibility to provide services or the Affidavit-Applicant Failure to Prove Lawful Presence is all that is required for contracts in excess of $5,000. A sole proprietor with no employees will not have an Employer Identification Number (EIN) and will not be able to participate in the E-Verify program. If the sole proprietor has employees, they will need to complete and submit the Annual Worker Eligibility Affidavit, the first page and the signature page(s) of the E-Verify MOU documentation along with documentation of affirmative proof of citizenship and/or permanent residency within the United States for contracts in excess of $5,000. As applied to MoDOT,RSMo 208.009 requires applicants for state grants, contracts or loans to provide affirmative proof that the applicant is a citizen or permanent resident of the United States or is lawfully present in the United States. This statute is only applicable to applicants that are sole proprietorships (individuals) and partnerships because other business entities, such as corporations and limited liability companies, are registered with the Secretary of State to lawfully conduct business in Missouri, and recognized as distinct from the people who own it. 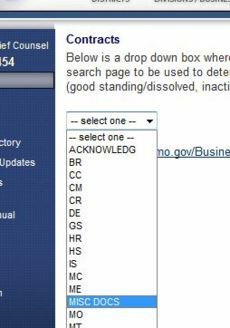 1) Go to the Chief Counsel's Office intranet site and, in the "--select one--" box, click MISC DOCS. 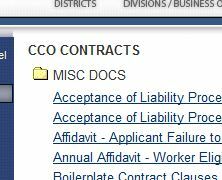 2) In the CCO Contracts page, the "Affidavit-Applicant Failure to Prove Lawful Presence" contract is the third from the top. Affirmative proof of citizenship and/or permanent residency is defined by this statute to include “documentary evidence recognized by the Missouri Department of Revenue when processing an application for a drivers license, a Missouri drivers license, as well as any document issued by the federal government that confirms an alien’s lawful presence in the United States.” If the applicant cannot provide the above-described affirmative proof, then the applicant may alternatively sign an affidavit under oath, attesting to either United States citizenship or classification by the United States as an alien lawfully admitted for permanent residence in order to receive a temporary state grant, contract, or loan from MoDOT/MHTC. The Affidavit-Applicant Failure to Prove Lawful Presence (see box on right) document can be found at CCO’s intranet site under contracts-MISC DOCS. An applicant who has provided the sworn affidavit required under subsection 4 of Section 208.009 RSMo, is eligible to receive temporary public benefits (1) For ninety days or until such time that it is determined that the applicant is not lawfully present in the United States, whichever is earlier; or (2) Indefinitely if the applicant provides a copy of a completed application for a birth certificate that is pending in Missouri or some other state. An extension granted under this subsection shall terminate upon the applicant's receipt of a birth certificate or a determination that a birth certificate does not exist because the applicant is not a United States citizen. The Annual Worker Eligibility Verification Affidavit, E-Verify and/or affirmative proof documentation/Affidavit-Applicant Failure to Prove Lawful Presence (see box on right) shall be in the district’s possession PRIOR to execution of any services contract in excess of $5,000. When contracting for Title Services and Mediation services consideration should be given to the likelihood that the contract in aggregate will amount to $5,000 or more and thus the Annual Worker Eligibility Affidavit and E-Verify documentation requirements shall apply. For contracts in excess of $5,000, the proper documentation must be included with any Request for Proposal (RFP) submitted to the LPA. When applicable, the proper documentation would include the Affidavit of Compliance and the first page and the signature page(s) of the E-Verify MOU, except as noted in EPG 236.3.11.1 Sole Proprietors. Regardless of whether an RFP process has been utilized the Affidavit of Compliance, E-Verify and/or affirmative proof documentation or Affidavit-Applicant Failure to Prove Lawful Presence (see box on right) shall be in the LPA’s possession PRIOR to execution of any services contract in excess of $5,000. The presentation of the Affidavit of Compliance, E-Verify and affirmative proof documentation need only occur once per calendar year. This page was last modified on 8 January 2019, at 15:27.